Another of my more recent goals is to try to cut down on the amount of potentially toxic chemicals I use in, on and around my body. One of my first areas to work on are cleaning products. We've been using "natural" types of dishwashing soap for years now and figured why not try out something else instead of my usual bar soap. I've been hearing for years about the antibacterial agents used in typical "antibacterial" soaps potentially helping to allow "superbugs" to grow, as well as causing other potential issues. 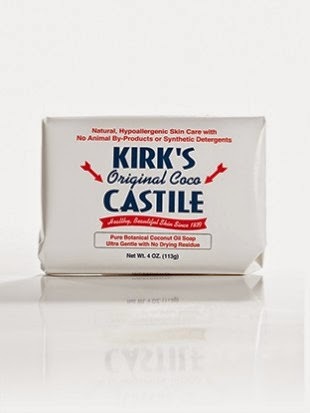 Recently in a big box chain store near home I saw Kirk's Original Coco Castile Bar Soap in a 3 pack for $3.28 and decided to give it a try instead of my usual Dial. I've also recently seen it in a co-op food market, also, as well as it being available on Amazon (currently through Marketplace sellers). The big box store's prices seem to be better, as expected. 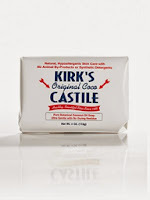 The ingredients are: "Coconut Soap, Water, Vegetable Glycerin, Coconut Oil, Natural Fragrance" and after trying it out for a few weeks and then picking up a bar of Dial when the three pack ran out, I must say that for me the Kirk's soap makes my skin feel better. My hands and elbows feel less dried out and I feel a little less "broken out" and irritated in spots that I tend to break out on, especially in the summer when I'm outside working in the yard, getting dirty. The reviews on Amazon are good, but as a few point out the bars seem to not last as long as the more commercially available bar soaps I'm used to. I've just started trying to dry them out before using them and I picked up a soap tray that I mounted high on the back wall of the shower and it seems to be helping the bars last a little longer so far.